Spanning five blocks in the heart of San Francisco’s prime commercial district, Embarcadero Center is one of the largest mixed-use complexes in the western United States. Offering four million square feet of office and retail space, the center encompasses five office towers, with three interconnected shopping levels in four of the towers. 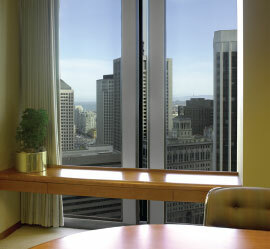 While Embarcadero Center’s five office towers gave tenants breathtaking panoramas of the city, tenants on the south, east and west sides of the buildings often needed to close heavy draperies over their vast windows to block the intense heat gain and glare when the sun was beating down during the day. In addition, maintaining a comfortable temperature through- out the five buildings during California’s sunny days was an ongoing—and expensive—challenge. After several years of investigating various options and potential solutions to reduce heat gain and reflectivity, improve tenant comfort and cut down on energy use, Embarcadero Center property managers eventually zeroed in on window film. The company interviewed several window film manufac- turers and dealers, and extensively reviewed their technical capabilities. Ultimately, Murtagh says, they chose Climate Insulating Products, Inc., a 3M authorized dealer, citing 3M’s Night Vision window film product line, as well as the com- pany’s worldwide name recognition and product warranties. According to David Lundquist, president of Climate Insu- lating Products, the 3M Night Vision window film was the perfect choice for Embarcadero Center. 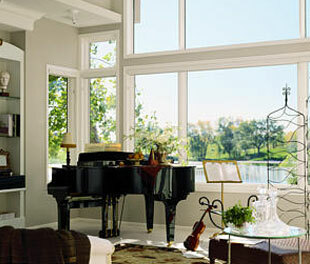 Often, films that reduce solar heat and glare are so reflective they are difficult to see through, especially at night. 3M Night Vision film blocks solar heat by up to 59 percent and UV rays by up to 99 percent, and it reduces glare by up to 72 percent— all while preserving views. The same technology that tones down reflectivity also makes Night Vision film color-stable, ensuring that the color won’t change over time. Those energy savings are also translating into cost reduc- tions, with an estimated $350,000 savings per year. 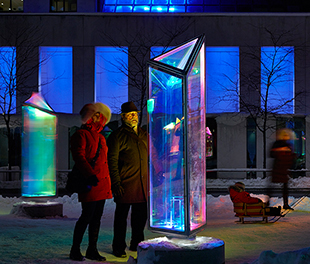 In addition, Embarcadero Center received a substantial rebate for the win- dow film installation from Pacific Gas and Electric. The energy savings made possible by 3M window films usually pay back the cost of the film and installation within three to five years; but in the case of Embarcadero Center, 3M estimates payback could be even sooner. Following the installation project, Lundquist says several tenants hired Climate Insulating Products to install the 3M Night Vision film at their own homes. 3M Dealer: David Lundquist, president and owner; Louis P. Miller, founder of Climate Insulating Products, Inc.
Project Notes: According to Brett Terry, a project manager at Climate Insulating Products, the com- pany had to work around established tenants and extensive built-in furnishings, so most of the instal- lation work was done at night.